Even though we've spent the last two weekends traveling abroad, we're hitting the Polish highways later today for another road trip in Poland. That makes three weekends on the road, and even I'll admit that I'm tired. So why do I travel so much? It's a question I've been asked a lot, especially lately, which I'll try to answer in this post. Since I grew up in a small town in the middle of Nebraska, I think part of me is making up for lost time. My first trip to Europe was for my 30th birthday. I missed out on that whole backpacking stage in my 20s, so now I'm doing it in my late 30s. I travel because I want new and different experiences and to enjoy new cultures. Growing up I was only exposed to really good Mexican food and really bad Americanized Chinese food. Not a very culturally-diverse area. Now, I've lived in two different cultures - Turkish and Polish - and traveled to places in Europe I never learned about in my world history classes. The more I learn, the more I want to know. I get a thrill from planning each trip and wonder what I'll see once we get to our destination. I like wandering around small streets, camera in tow, and catching glimpses of everyday life and local people. I should note that we’re not rich by any means, but simply plan our budget accordingly so we can afford to travel. When we moved abroad in 2010, we set a goal of being able to travel once a month, and nearly 5 years later, we done exactly that! If you want to travel, it means setting goals and priorities. I’d rather spend our money on a really good meal or a European trip instead of a fancy handbag or new clothes. The same theory holds true if you live in the United States. As an expat, I never truly know when our time abroad may end so I want to see as much as possible. I don't want to have any regrets. So even though I'm tired, I couldn't pass up spending a weekend with friends because this was the only weekend that would work for all of us. That previous weekend in Lviv was too good of deal to pass up with our plane tickets only costing 300zl each (about $80). We had an awesome weekend in western Ukraine while most of our friends told us we were crazy. The more I travel, the more I've come to realize how gigantic the world really is, and the more I want to see. Don't look down at San Sebastian, Spain! View over St. Emilion, France, in June 2014. View over the medieval city of Torun, Poland, in May 2014. 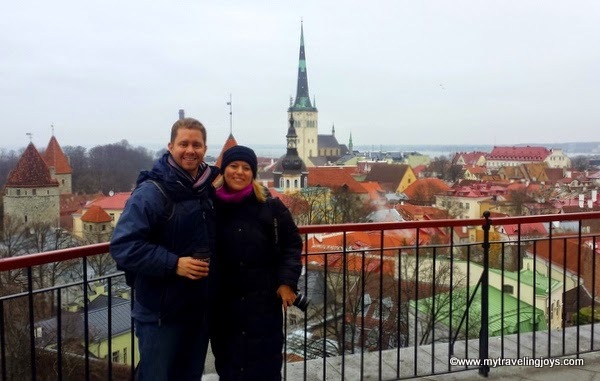 Stopping for a break in Tallinn, Estonia, as part of our November 2014 Baltic road trip. i used to travel so much! if i wasn't going somewhere every three weeks i couldn't sit still. i made mental notes of everything i saw that i loved. then i created it all in my own home. i didn't need to travel anymore. i have a few places i would still like to visit but i am very content at home! I travel for pretty much the same reasons. I can especially understand why you travel so much now as everything is so close and affordable. Reading about your recent travels is making me miss Europe so much! I can't wait to return next month. American expat in London. Lived 6 years in Turkey, Poland and Australia. Travelled to 40+ countries. Professional pastry chef. Avid photographer. Join me as I cook, eat, travel and write about my latest adventures. Smacznego!